On Monday we went to see the Magna Carta exhibit at the Canadian Museum of History. Understandably, they did not allow any photography of the two charters (Magna Carta and Charter of the Forests). Nobody is above the law of the land: The basis of equal justice at all levels of society. Women's rights: A widow could not be forced to marry and give up her property – a major first step in women's rights. Taxation: No taxation without the consent of the people. The Charter of the Forests provided rights, privileges and protections for the common man against the abuses of the aristocracy. 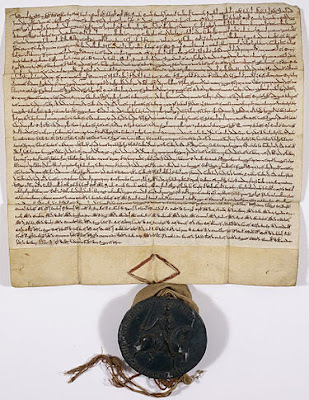 At a time when the lands were the most important potential source of fuel for cooking and heating, and of industries such as charcoal burning, as well as of collecting firewood, grazing, or of cutting of turf for fuel, this charter provided a degree of economic protection for free men. The exemplars on display in Ottawa were issued in 1300 and bear the seal of King Edward I. Durham Cathedral is the keeper of both these charters. It was impressive to see the 715-year old documents. 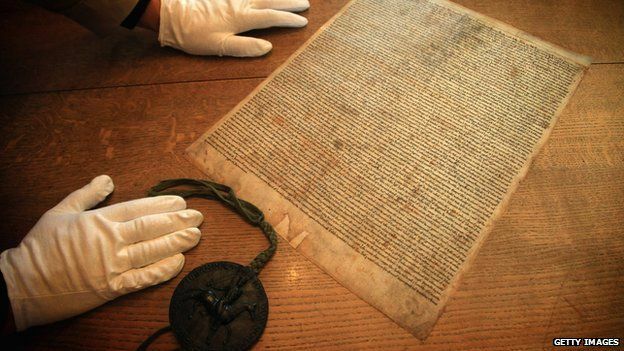 The dimensions of Magna Carta are about 18" by 20", and the Charter of the Forests is a bit smaller. If you wonder whether these documents are important, just ask yourself whether you'd rather live within the Anglosphere (UK, Canada, USA, Australia, New Zealand, etc.) or in any of Saudi Arabia, Syria, China, Russia, Nigeria, etc.